It's one of the more intriguing weekends at the box office every year – the weekend after Oscar nominations come out. This often becomes the final financial judgment on a number of prestige films, although some manage to delay this to the actual Oscar ceremony. Three new films are rudely crashing the party, however. The past few years have seen the early part of the year become the unofficial “Liam Neeson is a Badass” period, starting with Taken, then moving on to Unknown last year. 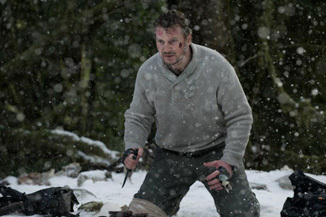 This year, the concept gets taken about as far as one can imagine as Neeson gets to take on nature itself in The Grey. Well, wolves specifically, as he and a group of survivors of a plane crash in Alaska have to battle their way back to civilization, with a pack of angry wolves picking them off one by one. It's the Manliest Movie in the History of Men Doing Manly Things (or at least since Burt Reynolds stopped being popular), and hey, look at that, it's directed by Joe Carnahan, who is the past ten years' answer to Shane Black. There's a bit of “are they kidding” to this premise, which could go a little Jaws: The Revenge if they're not careful about how they depict the animal antagonists (there's also the regrettable The Edge to call back to). There's also the problem that there's no damsel in distress like his last two films in this spot (or at least how it was depicted in the ads). Then again, we've got Liam Neeson taping broken bottles to his hands in place of claws, so that's pretty awesome right there. Reviews are surprisingly great for this, but I do think we're going to see some slippage from the mid 20 million openings of Taken and Unknown, to around $18 million.